Guus specializes in corporate law, M&A and investments and is engaged in setting up and structuring collaborations and joint ventures. His clients include venture capitalists, investment funds and companies involved in mergers or financing rounds. Drafting a letter of intent, a term sheet, a subscription agreement, a shareholders agreement, a joint venture agreement, a joint development agreement or any other type of a collaboration agreement, Guus will always think along with his clients and bring forward the best solution possible. To come to this best solution it is important to thoroughly understand the other party’s motives and interest. In the end, the result or the final solution is the most important. Guus advises investors en majority shareholders, but also the entrepreneur himself. Guus’ advice is sought on the legal structure of the company, its shareholders’ rights or its management board’s rights. 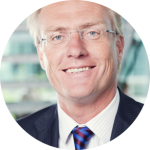 It is Guus’ experience that essential aspects of the structuring of a spin-out, investment or merger are missed, as a result of which the venture is doomed to become a failure. Guus is able to prevent this. In addition to the activities set out above, Guus also supports management boards who are taken over and shareholders who wish to assign their shares to others. His field of practice is broad and covers the whole area of corporation law, but especially aims at companies in the innovative sector, like biotechnology, ICT and media. Guus became an attorney-at-law in 1993. He has worked for international firms as Allen & Overy and the predecessor of Hogan Lovells. In 2005 and 2006 Guus started an office on the Netherlands Antilles. After this adventure he moved to the Gooi en started The Law Factor with Taco. In 2009 Guus finished the post doc education Grotius corporate transactions.